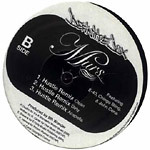 Hustle is featured in its original version on Side A, and the remix on side B, featuring E-40 (! ), Chingo Bling, & John Cena (Yes, the WWE wrestler.). The last two releases on Def Jux have featured Humpty Hump and E-40. Underground labels take note.